The origins of most electro-mechanical devices rely on ideas inspired either by Maxwell or Rayleigh, so it is interesting to enquire why the first successful electrical disc cuttter and the accompanying WE4A pickup were developed in the USA and not Britain. The generation of electromagnetic waves from accelerated ( ie oscillating ) charges. The propagation of electromagnetic disturbancess (signals) along cables. *Maxwell:James Clerk Maxwell: A Treatise on Electricity and Magnetism. The first and most difficult problem was solved by George Francis FitzGerald of Trinity College Dublin. "On the Quantity of Energy Transferred to the Ether by a Variable Electric Current" Transactions of the Royal Dulin Society: 19 November 1883. The second problem was solved by Oliver Heaviside ( 1850 - 1925 ), a highly eccenctric mathematician and engineer of genius working outside the British establishment. He rediscovered a version of the Laplace Transform which came to be named "Heaviside Operational Calculus" His research into propagation along transmission lines would eventually lead to Harrison's cutting head and and its complement - the WE4A. Heaviside's work showed the importance of inductance in the transmission of signals along a line. An increase in inductance increases the characteristic impedance of the line, so that the the resistance of the conductors becomes less significant and the attenuation lower. High voltages with corresponding lower currents are employed in power transmission for the same reason. L = inductance per unit length. C = capacity per unit length. Sir William Henry Preece (1834 - 1913) was first Electrician and Engineer - in - Chief of the British Post Office. Sir William did not believe in the existence of self inductance. In 1888 he described it as "just a lot of bugaboo!" As a consequence, Heaviside's ideas were not applied to transmission problems in Britain, but were forced across the Atlantic where they were taken up by Professor Michael Pupin at Columbia university and then, eventually, by Bell Labs. Pupin greatly improved American telephony by winding a thin steel ribbon around cable to increase the self inductance. This was found to be very expensive, and, to decrease the costs, an approximation was made by adding lumped inductance along the line at regular intervals. This worked fine up to a critical frequency where the lumped nature would manifest itself and reject all higher frequencies. This apparent failure at high frequencies proved the germ for progress, not only in telephonic transmission, but also for disc recording. It suggested to the fertile minds at Bell that repeated or iterative networks could be made flat or transparent up to a certain frequency and above this frequency to sharply reject all others. From the clue described above, Campbell, Zobel and Carson working at Bell developed classical filter theory. Networks transparent to any prescribed range of frequencies could be designed at will. Immersed in such a milieu, Maxfield and Harrison realised that this was the way forward in disc recording, since any mechanical system can be expressed as an analogous electrical network. Compliance or springiness converts to capacitance. Converting the other way, there does not seem to be any mechanical equivalent for mutual inductance. Norton, the Norton of Norton's Theorem, had the desk next to Harrison at Bell and his influence on the development of network theory and of electro - mechanical equivalents should never be underestimated. In early pickups the needle usually was coupled to a large iron armature of great mass. 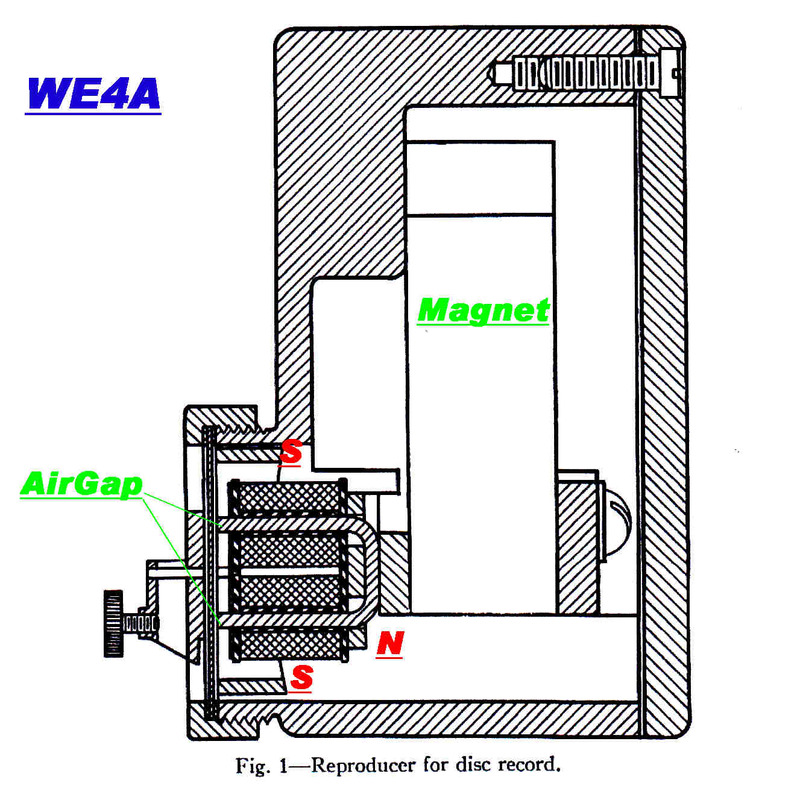 The designer of the WE4A realised that the required signal was already present in the deflection of the centering spring. All that had to be done was to read this deflection in some way. In the WE4A the centering spring is made into a circular steel plate - reinforced in the centre so that it bends anti-symmetrically. As the needle deflects to the right, the bottom of the plate deflects inwards and the top outwards. The plate is made part of the wall of a sealed enclosure filled with oil. The plate forms part of a magnetic circuit, so the air gap at the top is increased and the gap at the bottom decreased. This means that the magnetic flux is diverted either into the top or bottom coil, and so induces a voltage into these coils. The symmetry reduces even order distortion. The total flux around the magnetic circuit is constant. Only the iron under the two coils experiences a change in flux. The pickup, then, is a true variable reluctance system. It has a constant velocity response. The plate forms part of a sealed enclosure filled with oil. (1) The oil against the plate produces mechanical damping. (2) The oil covering the windings protects them. For the time of its design (1925 - 1926), the pickup was a lightweight. The needle point weight on mine is 79.9 gms. Since it uses no rubber in its design, the characteristics remain constant over great lengths of time. *Compliance = ( Elastic Deflection )/( Force ) = 1/S where S is the spring constant. It is assumed that the pickup is tracking the disc, so that the needle tip velocity (Voltage) is determined entirely by the disc. It can therefore be represented as an independent voltage generator. 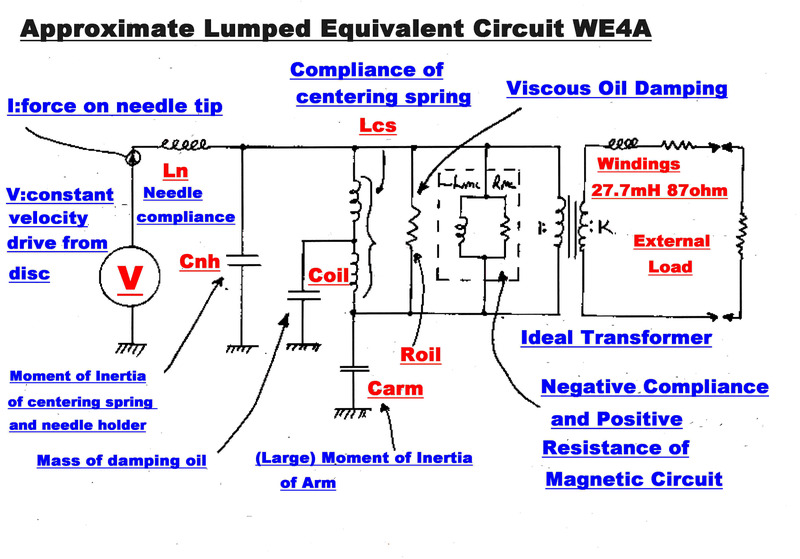 The lumped equivalent circuit can, at best, give only a rough approximation to the performance of the WE4A, but it does explain the general behaviour and the dependence of the response on the compliance of the steel needle. [A] Oil must flow in and out of the magnetic gap, so the viscous damping has a capacitive as well as a resistive component. [B] The viscous damping is distributed along the retaining spring. [C] The retaining spring, in the form of a circular plate, probably has significant distributed mass. [D] The needle clamping screw acts as a mass supported by a short cantilever, and so should be represented as a series tuned circuit across the main moment of inertia Cnh. In the equivalent this is lumped in with the moment of inertia of the needle holder. [C] The WE4A equivalent then reduces to the simple resonant system shown in the above diagram. Ln represents the compliance of the steel needle. The length of both "loud" and "soft" steel needles is about 16mm. The diameter of "loud" needles is about 1.5mm: the diameter of "soft" needles is about 0.8mm. The output inductance of the equivalent Thevenin generator increases giving rise to high frequency attenuation as shown in the steady state frequency plots above. The conclusion is that soft needles not only decrease the signal level, but act as a tone control to give high frequency attenuation. In the equivalent circuit the needle tip forces are represented by the current in the inductor Ln. Needle tip forces are at a maximum when the inductors resonate with Cnh to give a peak in the response. They are limited only by the oil damping resistance. In acoustic reproducers the horn presents a suitable damping resistance. In electrical reproducers the external resistive load does not provide sufficient damping, so extra damping has to be introduced. This is usually in the form of lossy rubber. 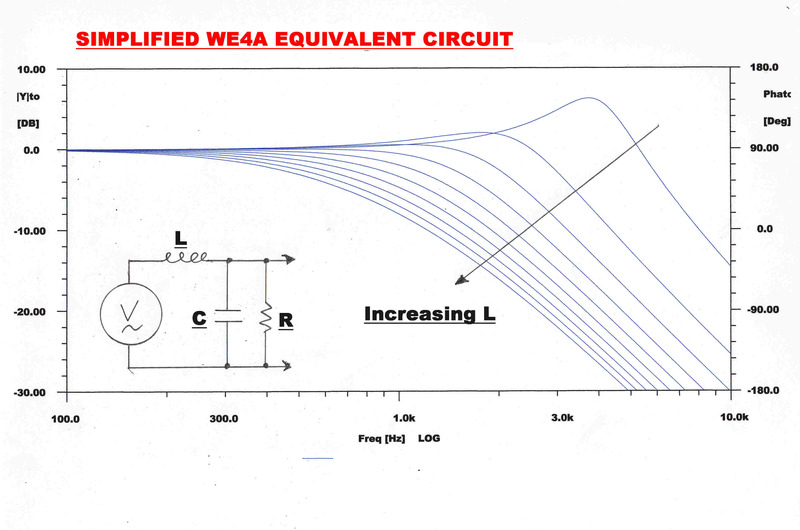 In the WE4A oil damping is used, and this accounts for the long life and stability of characteristics of the WE4A. The inductors Ln and Lcs can also resonate with the large capacity representing the mass of the pickup head and arm. This also increases the needle forces at a much lower frequency. With "soft" needles Ln is large and the current through it decreases. "Soft" needles therefore greatly reduce needle tip forces. Recording levels have increased since the WE4A was introduced in 1926. It is found the the WE4A tracks modern heavily cut discs with low distortion. 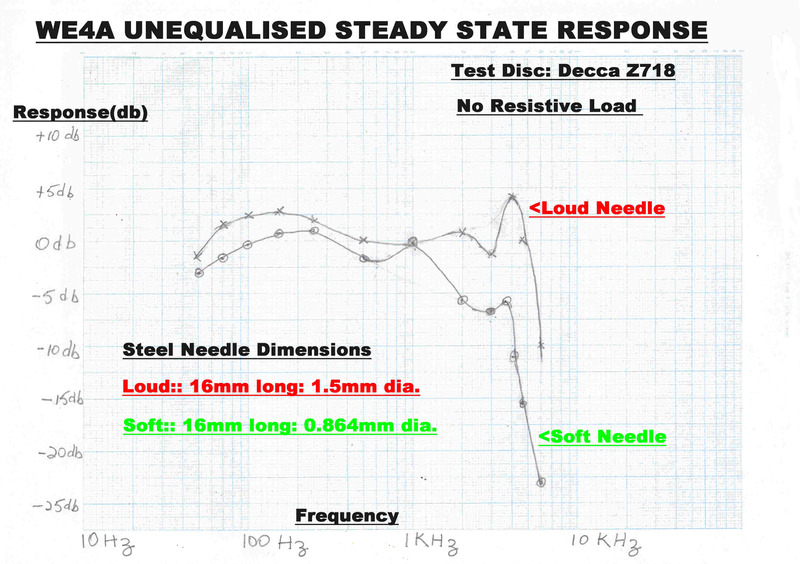 A combination of needle wear and reduced track velocity increases the tracing distortion towards the inside of a disc. To minimise this effect most transcription discs were inside start. The output of the WE4A on old worn discs is much cleaner than that from a modern light weight cartridge. The effect is purely mechanical. Initially the steel needles grinds to the shape of the groove, and the weight of the WE4A ensures that the needle stays in the groove and is not buffeted by dirt and steel particles. Both curves have been normalised at 1KHz. to emphasise the attenuation of high frequencies with "soft" needles. The test results follow the general trend predicted by the lumped equivalent circuit. The pickup was designed for use with "loud" needles, so the 3db peak at 4KHz is intentional. It was said to render the reproduction more lively. The output level was high and the output impedance low, so the WE4A can drive a long cable to the amplifier. Optical sound heads with an inbuilt amplifier were designed to produce an output comparable to the WE4A. The folowing tracks illustrate the quality of reproduction with the WE4A. Transducer: Magnetic - Variable Reluctance. Electricals: Constant velocity above 250Hz. :: Constant amplitude below 250 Hz. All filtering 6th order maximally flat. Joe Daniels and His Hotshots in "Drumnastics"
Joe Daniels: born 1908, Zeerust/Transvaal, South Africa. This disc is from the ABC record library in Brisbane. Although it carries over 80 years of wear and tear, it probably gives a good idea of the broadcast quality from the ABC in the thirties and forties when the WE4A was the standard studio pickup. 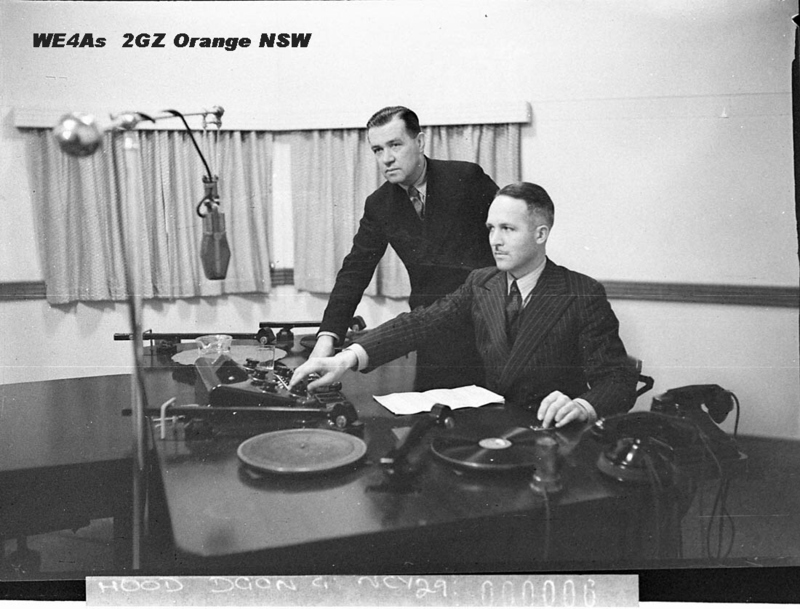 In the late thirties and into the forties many of the national transmitters employed over 30db of envelope feedback, so, overall, the broadcast quality was good. Note the increase in tracing distortion towards the end of the track as the steel needle wears and the track velocity decreases. Inside start discs greatly reduced this distortion. Les Paul: born Lester William Polsfuss 9 June 1915. Pioneered the solid body electric guitar and multitrack recording. First disc to disc, then using 8 track tape made by Ampex. Although designed in 1925 when the recording level was low, the WE4A will track heavily modulated 78 discs of the late era as illustrated below. 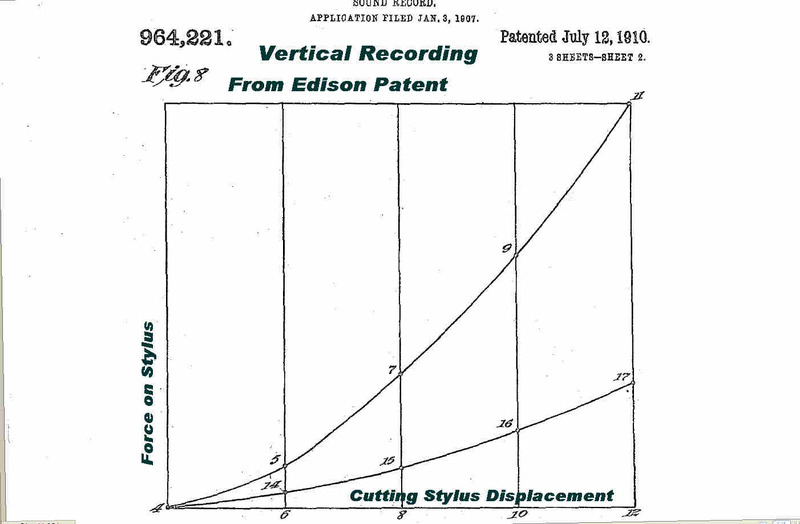 THE 1911 HIT PARADE: Early Acoustics. Note: This disc came from a sheep station (ranch) in the West of Queensland, It was probably a hit with the Jackeroos (cowboys) in 1911. It was covered in clay and grit, which had to be hosed off. It is amazing that the WE4A managed to lift a relatively clean signal from such a surface. The WE4A proved to be a superb device for playing worn acoustic lateral discs. A modern light weight pickup responds to every obstacle on the disc such as small pieces of grit and steel. Because of its weight, the WE4A simply ploughs through them. Further, the groove shape and size is highly variable, The steel needle rapidly grinds to fit the groove as was intended with the old discs. 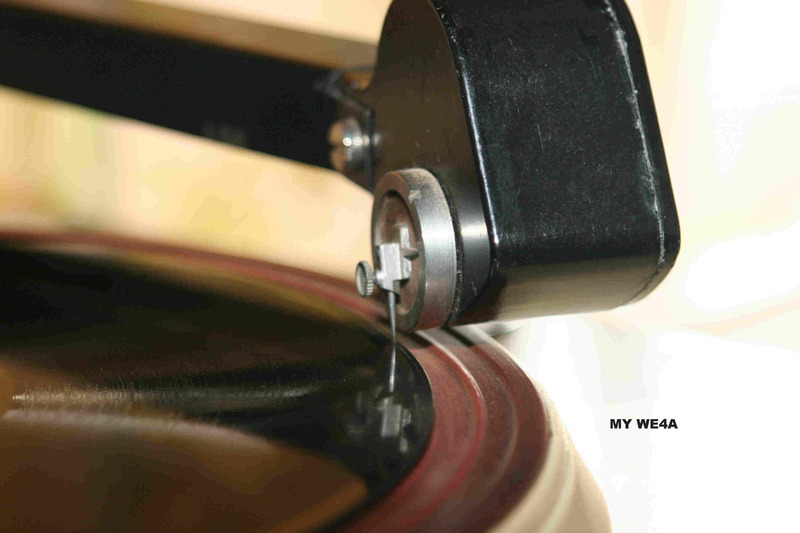 At the end of this section a worn disc recorded in 1927 is played with a modern light weight pickup and the WE4A to illustrate the difference in performance. George Formby with Ukulele and Orch. Here is an example of the WE4A negotiating a heavily worn disc from the thirties. On discs with a surface which is no longer flat, but has become rippled, the WE4A does introduce some low frequency rumble. This is noticeable on this disc and is very characteristic of the WE4A's performance. Note: The sustained note at the end of this track is 14 Seconds long and has a measured frequency of 1.455KHz. The waveform is close to sinusoidal. The third harmonic is 32db below the fundamental. It is interesting to evaluate which note this is in the musical scale. where f is the frequency in Hz. fo is the reference frequency. n the number of intervals between them. Middle C = fo = 256 Hz. Considering the errors in orchestra tuning, the singer's sense of pitch, and the tolerance on recording and reproducing turntable speeds, it seems close to a miracle that n comes out so close to an integer. In other words Erna has nailed it right in the middle. Two Cs above middle C occupy 24 intervals, so that the note is 6 intervals above this or F sharp. Two sides of the same worn disc are played with a modern light weight pickup and then with the WE4A. The output of both pickups was subjected to the same equalization. Below 250Hz. - constant amplitude. Above 250Hz. - constant velocity. Tracks 1 and 2 reproduced with a Stanton MkII Cartridge. Stylus:- 3 thou. spherical tipped. The disc was recorded in 1927 : was very popular and extensively played on acoustic reproducers, so that it shows visible signs of wear. Track1 : Part5 played with the Stanton. No filtering. Track2 : Part6 played with the Stanton. The WE4A has a cutoff frequency of 5KHz. For a fair comparison this track has been filtered with a 5KHz 5th order Maximally Flat filter. The result is still nowhere as clean as the WE4A output. Track3 : Part5 played with the WE4A. Track4 : Part6 played with the WE4A. This cutter was one of the masterpieces of electro-mechanical design of the 20th century. It also had a profound effect on the shape of the century with the enormous improvement in the quality of disc recording and the introduction of film sound on disc. The development of classical filter theory at Bell. The realisation of the dynamic equivalence between electrical and mechanical systems. Linear differential equations with real constant co-efficients govern the dynamic behaviour of both electrical amd mechanical systems. If an electrical system is designed to have the same governing differential equation as a mechanical system, then one will be the exact analog of the other. With a magnetic transducer, force is produced by current and voltage is produced by velocity. It is then natural to equate these variables.The link between the two then becomes an ideal electrical transformer with the transformer ratio determined by the transducer constants. It is possible to get an equivalent with the variables reversed, but then the transducer is represented by a gyrator with a much indreased difficulty in interpretation. With a piezo-electric transducer, force is produced by voltage and current is induced by velocity, so it is natural to equate these. Capacity translates to mass or moment of inertia. Inductance translates to mass or moment of inertia. Resistance translates to viscous force constant. Conductance translates to viscous force constant. Methods of High Quality Recording and Reproducing Music and Speech based on Telephone Research. Bell Telephone Journal: July 1926 pp 493 -- 526. 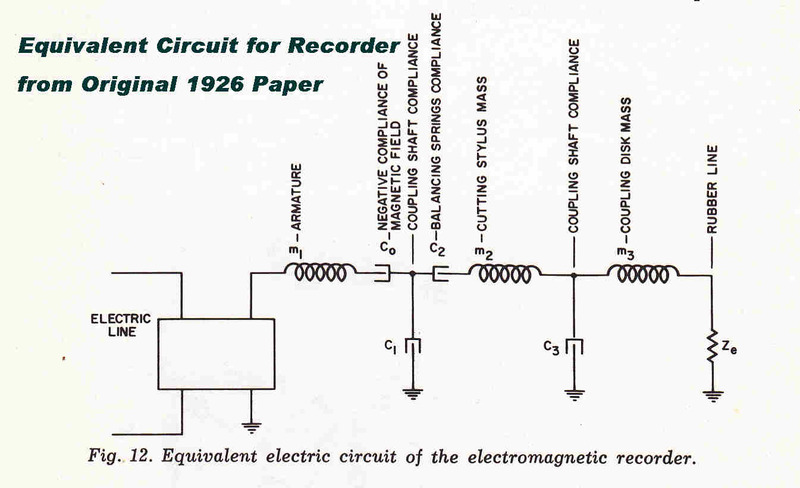 The recorder had a magnetic transducer, but the equivalent circuit included in the paper uses equivalents appropriate to a piezo-electric transducer. Consequently, much of the equivalent is represented by a nameless block. It also difficult to relate the circuit to the dynamic behaviour of the mechanical system. The complete equivalent circuit including the driving amplifier, and using appropriate equivalents, is given below. A sectioned drawing of the cutter is shown opposite. Each mechanical element is tagged with its electrical eauivalent. The required output is the velocity at the tip of the stylus. The maximum displacement for a 78 disc is +(-) 2 thou. of an inch, so, for the small angles involved, angular displacement translates into linear displacement. The full equivalent circuit using equalities for a magnetic transducer are shown opposite. If the two inductances and resistance to earth ( -La, Lc and Rc ) are removed, the circuit reduces to a classical low pass constant k filter terminated at the far end. Over the pass band the filter reflects a constant resistance, Rf, into the primary of the transformer, so that the total primary resistance is Rtot = Ra + Rw + Rf . 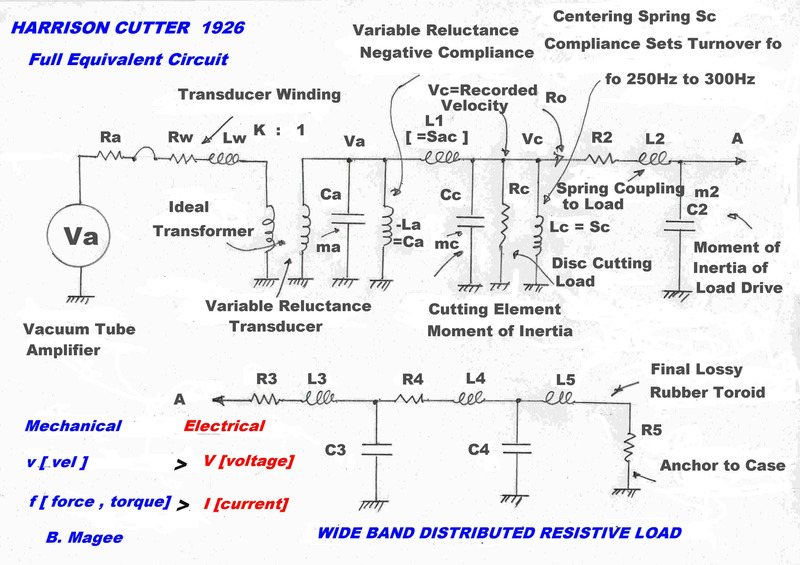 If the winding inductance of the transducer, Lw, is not to cause high frequency attenuation, then the resistance must be greater than the inductive reactance at the cutoff frequency fc. The filter, then, is driven from a resistive impedance. The filter is a classical constant k low pass filter. The filter has three sections: two half L sections at the end and a full T section in the middle. The filter is terminated at the receiving end and driven from a resistive impedance at the sending end. We now discuss the action of the three elements which we removed from the equivalent circuit to produce a classical constant k low pass filter. The required output is not taken from the terminating load but from the centre of the middle section. The voltage appearing across Cc represents the required output, the angular velocity of the cutting stylus. In lateral recording the dynamic forces at the stylus tip are proportional to velocity. They therefore appear as a resistive load across Cc. Note: In vertical recording the forces are highly non-linear. A good account of this is given in Edison patent No.954,221 July 12 1910. [A] It is desirable that the recorded signal be independent of the characteristics of the master disc. [B] The cutting process produces random forces at the tip of the cutting tool. These excite movement which will be cut back onto the disc as noise. Keeping Rc high compared with the filter impedance minimises this effect. With constant velocity recording the displacement is inversely proportional to frequency, so that this becomes excessively large at low frequencies. The introduction of a 6db/octave slope in the velocity response at low frequencies results in constant amplitude recording. This is conveniently introduced by the centering spring Lc. At low frequencies this shunts the signal to earth. The turnover frequency fc is set by the time constant of the total driving resistor R// and the inductor Lc. Note that the turnover frequency is set by the strength of the centering spring: not by a network in the amplifier. At low frequencies the recorder reduces to a very simple system. The curerent drive is independent of frequency, and so produces a constant torque applied to the centering spring: giving a constant displacement and so constant amplitude recording. Imagine the DC field of the recording head energised with the audio input left open. If the magnetic vane marked ( Ca La ) is displaced from its central position, magnetic poles are induced on its tip, and these produce a torque in the DC field. The torque is proportional to angular deflection, but is of opposite sign to that produced by a spring. It therefore must be represented by a NEGATIVE compliance. No data was given to calculate ωo , but it is assumed the squared term is very small at high frequencies approaching cutoff, and so has little effect on the constant k filter action. Note: There are accounts of the pole piece hitting and sticking to the stationary laminations on very high recording peaks. The design of electrical wide band resistive loads is difficult: the design of wide band mechanical loads is even more difficult. Wire wound resistors exhibit inductance and the resistance changes with frequency due to skin effect. Rubber exhibits histeresis and so resistance along with compliance. The histeresis changes with frequency to mimic the complications of skin effect in wire wound resistors. This technique is illustrated in the bottom part of the cutter equivalent circuit. Eventually a termination of 0 ohms will be reached and the output operated into a short circuit. The technique was used in the fifties to terminate the output lines in distributed amplifiers. 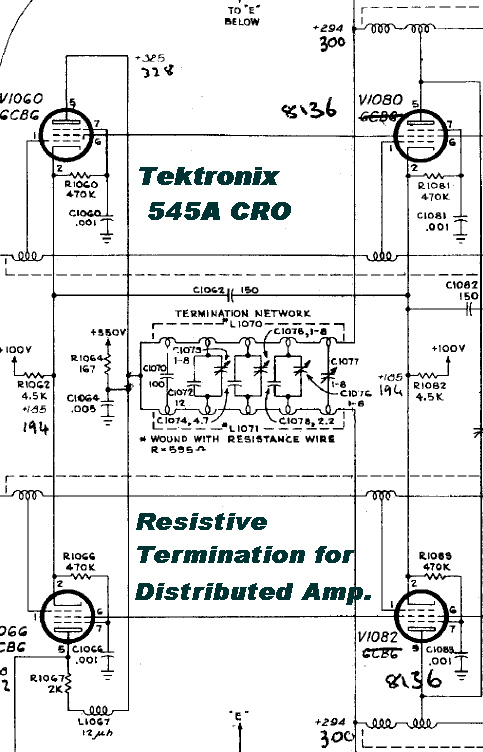 An example used in the Tektronix 545A oscilloscope is given opposite. It is interesting to note that the Bell engineers ( probably Norton ) were aware of this technique in the twenties and used it first in a mechanical analog form. The lumped line described above approaches a transmission line as the size of each element is decreased. The characteristic impedance of a lossless uniform line is purely resistive, and so a line of infinite length would act as an ideal load. Lines in the real world need not have an infinite length. The characteristic impedance of a uniform transmission line closely approximates a resistance if the attenuation per wavlength is not too great. If the line is of sufficient length, so that the reflected wave is small compared with the transmitted wave, then the input impedance will still remain largely resistive. Further, it does not matter if the trmination is a short or open circuit. A lossy rubber transmission line replaced the lumped equivalent in the final form of the cutting head. Its response was more even than the lumped line and it was easier to manufacture. Unfortunately the properties of rubber are time and temperature dependent. This was a disadvantage in an otherwise brilliant design. The application of motional negative feedback by Bell rendered mechanical damping unnecessary and produced a design with an excellent dynamic response. 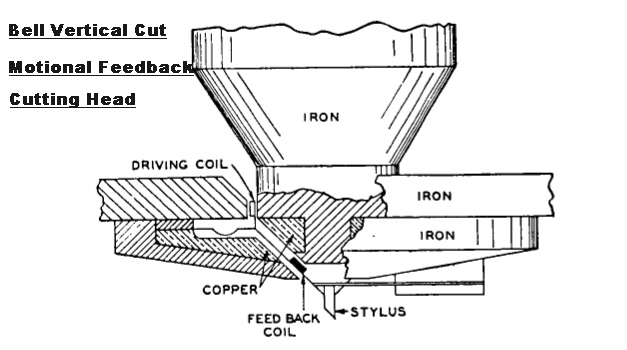 Bell were the first to apply motional feedback to a vertical cutting head in the Thirties. Sectioned drawings of the cutter are shown. Note that no damping material is required in the head: the motional feedback has complete control over the movement of the cutting stylus. Preventing inductive pickup by the motion sensing coil from the main driving coil. Ensuring the motion of the pickup coil and the cutting stylus are the same. Coupling between the two coils is reduced by a thick copper ring shield. The pickup coil is attched as close as possible to the cutting stylus to ensure they share the same motion. The mass and compliance of the moving system produce high Q mechanical resonance at about 700 Hz. This produces a transfer function stable under a large degree of feedback. The feedback flattens the curve over the complete audio spectrum. The recording amplifier for the motional feedback cutting head is shown on the right. The transfer function of the forward path is modified by an internal feedback loop with elements B,C,D. The transfer function of the motional feedback path is modified by the network A. In a vacuum tube the transfer characteristics of the control, screen, and suppressor grids are different non-linear functions, and it is not good practice to apply the input and feedback signal on different grids. The internal feedback is applied to the screen of pentode 33. The input signl is applied to the suppressor of pentode 32. The circuit technique criticised above comes from a patent by Wiebusch. Note that when a signal is applied to different grids, a component of plate current is the product of the two - not a desirable state of affairs in a linear system. The following hill and dale tracks were cut with the feedback cutter. They were not commercial recordings, but experimental tracks cut by the Bell engineers in the thirties. 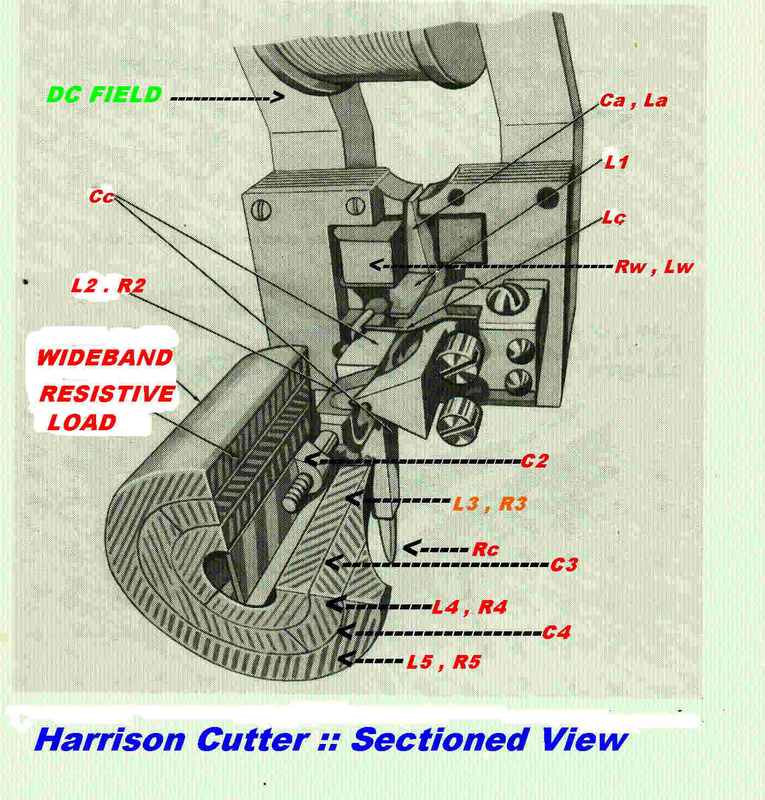 The folowing tracks illustrate the quality of early tracks cut with the Western Electric Bell Harrison Cutter. Initially, Bell decided to limit the use of the recording system using the Harrison cutter to the USA. The system was licensed to Columbia. One of the first tasks was to make a demonstration disc. The British overcame this monopoly by buying the Columbia Company. Admired by musicians because he could play all the instruments in the band. Constant Velocity above 250Hz. :: Constant Amplitude below 250Hz. Maximally Flat 6th order Low Pass Filter: 3db at 6KHz. Maximally Flat 6th order High Pass Filter: 3db at 50Hz. Microphone: High quality condenser microphone type 394 designed by Wente of Bell Labs. Preamp: Type 47A mounted in a cylinder directly under the condenser microphone. Battery powered miniature triode type 239-A with thoriated tungsten filament. No feedback. Recording amplifier: Transformer coupled push - pull triodes with thoriated tungsten filament. Designed by Henry Harrison of Bell Labs. Transducer: Moving Iron. No feedback. Response: Flat with low frequency turnover built into head. Constant Velocity - Constant Amplitude turnover adjustable between 250Hz and 300Hz. The WE Harrison recorder gave rise to sound on disc for movie film called "VITAPHONE"
Equipment installation into theatres took some time, so short sound clips were made before the first feature films for demonstration purposes. These usually lasted from eight to ten minutes. At the end of the run the discs were returned for destruction. However, this did not occur in Queensland, Australia. The end point was usually far removed from a capital city. Consequently, Vitaphone discs sometimes can be unearthed in remote locations in Queensland. The following disc is one of them, and, despite the age and wear, gives a good indication of the audio quality of the first "film" sound. It is believed that the audio quality of "sound on disc" was much better than that of the first "sound on film". 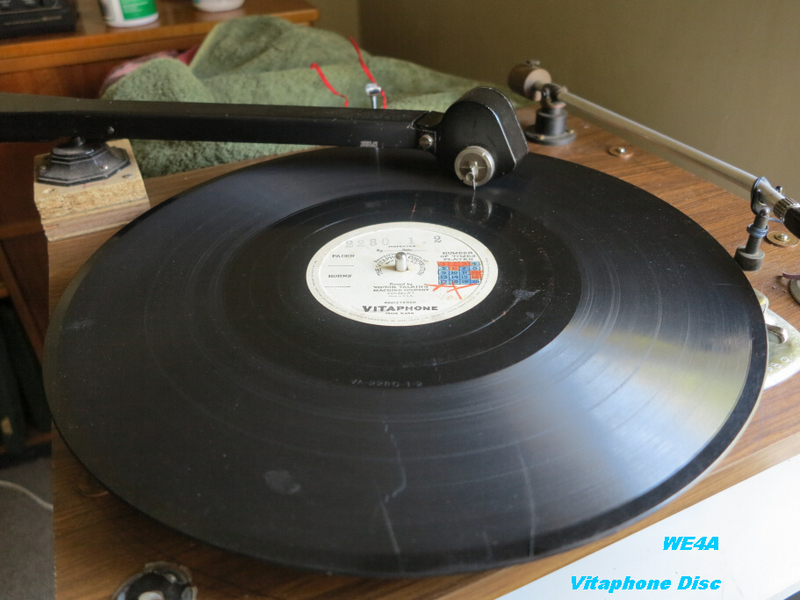 The first very temporary setup for reproducing a Vitaphone disc with the WE4A is shown opposite. 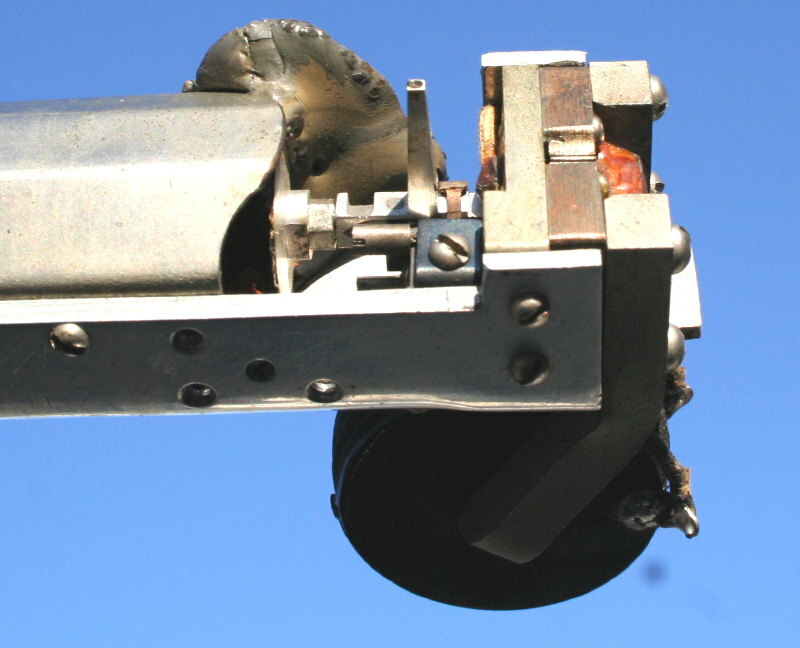 The "drag" from the WE4A on heavily cut passages produces a large torque on the outside of a 16 inch diameter disc. It was found that this was enough to slow the average turntable down, and a professional transcription turntable had to be pressd into service. 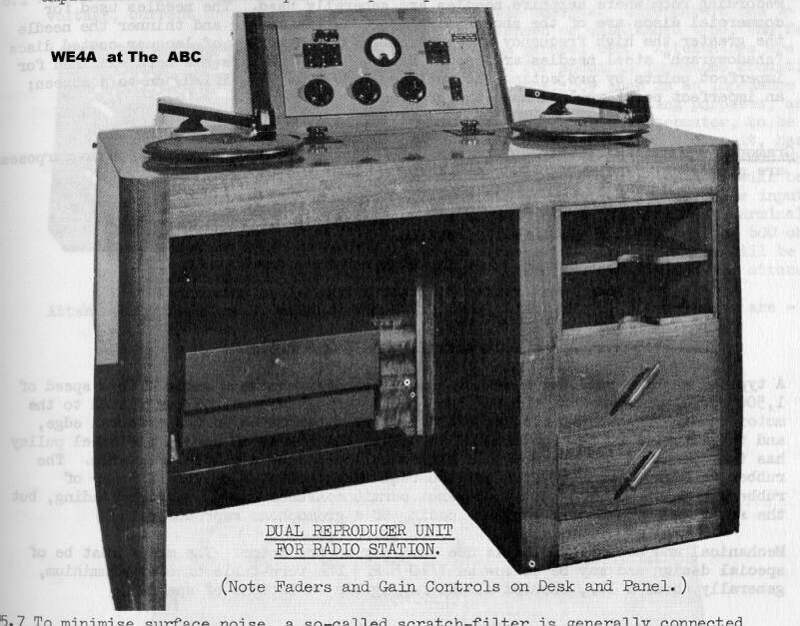 The turntable used was Australian designed and made - A Byer Professional 12. Comments: Damaged Centre:Very poor surface. in "Songs as You Like Them"
Comments: No recording date: very poor surface.